Journey across Russia and Mongolia in luxury on the iconic Trans-Siberian Express. Explore breath-taking scenery, complex cultures, and historic cities as you traverse the Asian continent from Vladivostok to Moscow. On this journey you will dive into cultures, not just view them as an outsider. Russian language lessons, lectures, and cultural activities ensure that your time is influential, meaningful, and unforgettable. Top destinations on this journey include Lake Baikal, the deepest lake in the world, Ulaanbaatar, the capital of Mongolia, and historic Russian cities like Yekaterinburg. The Golden Eagle train is your home-on-wheels for this truly unique journey that offers you a once in a lifetime experience. Today you begin your journey in Vladivostok where you will be met at the airport and transferred to the four-star and centrally located Hotel Hyundai. Here you can attend a welcome reception, meet other guests, and prepare for your 15 day journey. Day 2 - Vladivostok: "Ruler of the East"
Explore this military port on the Sea of Japan, also known as the "Ruler of the East." This city was closed off from outsiders for more than 60 years, and is now an excellent destination to explore military attractions. You can visit a preserved World War II submarine and a notable suspension bridge over Golden Horn Bay. After you have seen these sights, arrive at Vladivostok Railway Station and enjoy a champagne reception before boarding your Golden Eagle luxury train to the tune of a Russian military band. Enjoy dinner on the train and begin your westward journey. 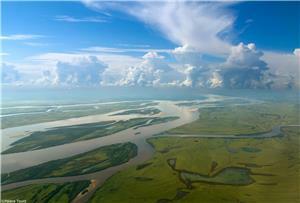 Arrive in Khabarovsk, a city located on the Amur River just 15 miles (25 km) from China. This city has been a military post and home to indigenous populations for centuries. See the memorial to the city's namesake, explorer Yerofey Pavlovich Khabarov, and visit a World War II memorial to Russians killed during the conflict. You will also explore the Regional Museum, home to many cultural and historic artifacts of the region. 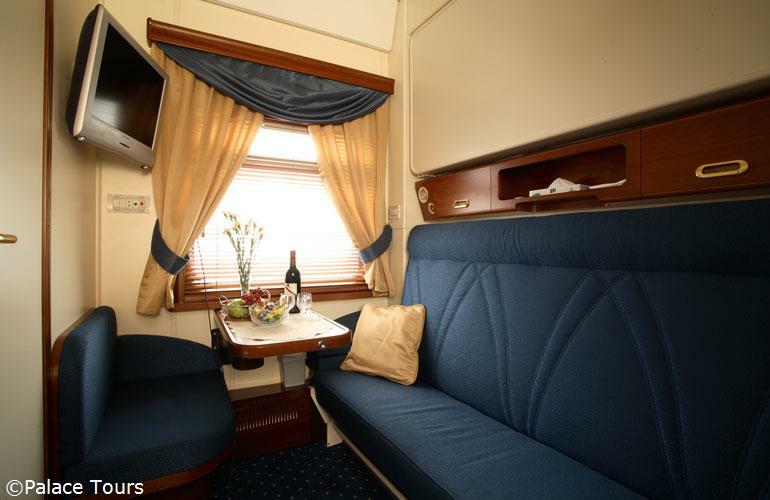 Spend today on board your luxury train, relaxing and viewing breath-taking scenery. The train will journey close to the Chinese border, following the Shilka and Amur Rivers. Take this opportunity to attend an on board lecture or Russian language lesson. Relax on board your train as you continue westward. Take Russian lessons, watch a DVD, listen to our resident musician, or socialize in the Bar Lounge Car. 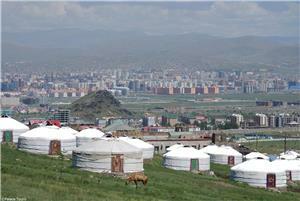 The next stop on your journey is the capital of Mongolia, Ulaanbatar. 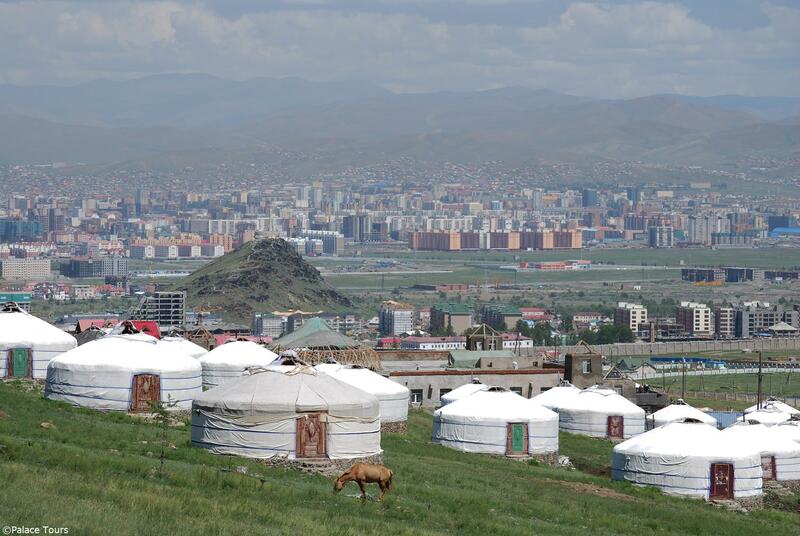 As you travel through Mongolia you will notice that this former dynastic empire is home to beautiful scenery, picturesque Yurts, and interesting nomadic people. Visit Gandan Monastery, also known as "The great place of complete joy," a Buddhist Monastery that houses over 500 months. View the monument to Genghis Khan, legendary Mongol leader, in Chinggis Square, before continuing out of the city to Gorkhi-Terelj National Park. Here you can meet a nomadic family or go horseback riding. As part of our Freedom of Choice option you can alternatively chose to stay in the city and visit the National Museum and Bogd Khan Winter Palace Museum. These site provide you an in-depth history of the country. Part of this day includes shopping and exploring the city, where you can buy famous Mondolian cashmere and experience a performance by Mongolian throat singers and contortionists. Today you visit the capital of the Buryat Republic, Ulan Ude. This historic city is home to the Buryat people, and you will have the opportunity to experience their culture as you tour the Old Believers' Village and a concert. 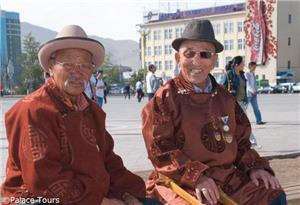 Enjoy the welcoming atmosphere and interesting experience of this unique Mongol-Buddhist region. Lake Baikal is the deepest lake in the world and a stunning natural wonder. Home to 20% of the world's freshwater, this lake also holds 50 species of fish and freshwater seals. Your train, hauled by a Soviet era steam locomotive for this portion of the journey, will wind around the lake, providing beautiful views from several angles. We stop to take pictures, weather permitting, and you have the option of taking a dip in the cool waters of Lake Baikal. Our next stop is the town of Listvyanka where you can visit Lake Baikal Museum and Aquarium to learn more about the lake. Enjoy a barbecue dinner, including smoked omul, a fish that only lives in the lake. A Freedom of Choice option is to go on a hiking adventure through the hills alongside the lake. You can take a Russian cooking lesson or visiting a Russian Dacha (summer house) with our Freedom of Choice option. Today you have the opportunity to relax on your luxury train as you make your way west across beautiful landscapes. Novosibirsk is a modern city with Soviet influences located in central Russia. Here you will tour Lenin Square, named after the Russian political leader and home to a large statue of its namesake. View the adjacent Opera House where two permanent ballet and opera companies perform. With Freedom of Choice you have the option to visit Novosibirsk’s excellent Railway Museum or the Mineralogical Centre which displays Siberian minerals. Today you visit Yekaterinburg, the capital of the Ural Mountains. This city was founded by Peter the Great in 1723, and has a dark past from the Russian Revolution. Here you will visit the church that was built on the site where the Romanovs were executed by the Bolsheviks in 1918. Your tour also takes you to the border between Europe and Asia, where you can drink champagne with a foot in each continent! With our Freedom of Choice Option you can also visit the Museum of Military Machinery. This new museum holds exhibits on military hardware and civilian vehicles, providing insight into the Soviet era. 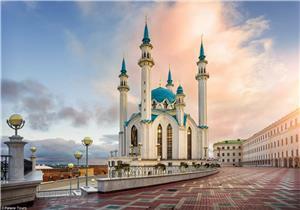 Your train arrives in Kazan, a beautiful and cultural city on the River Volga. 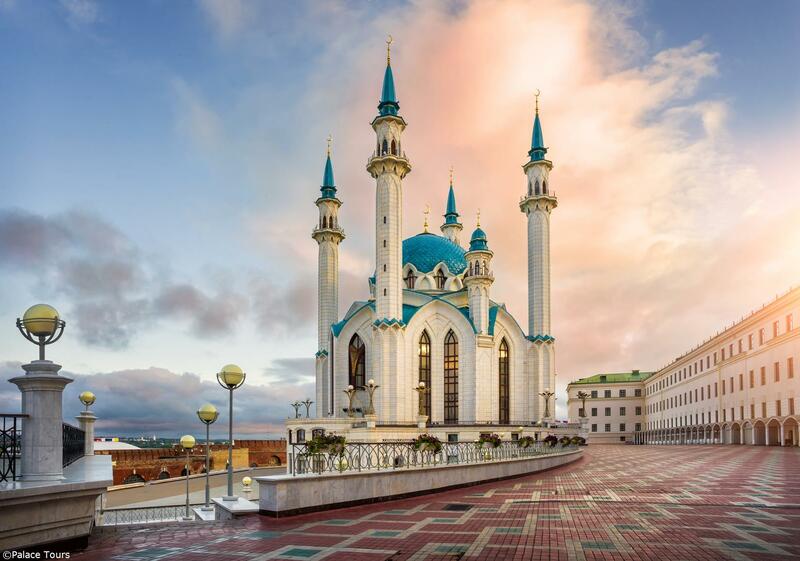 Take a tour of the city, exploring the Kazan Kremlin, a citadel built by Ivan the Terrible and home to a picturesque mosque and domed cathedral. Enjoy a private concert to honor famous opera singer Feodor Chaliapin (1873-1938). You also have the opportunity to explore the pedestrian area of Kazan at your leisure. Today you will arrive in Moscow and tour the city's famous historical and cultural sites. 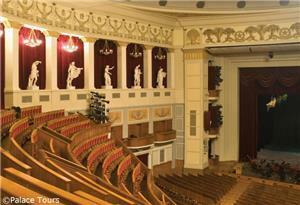 This tour will take you to the Kremlin and to see the Tsars' treasures in the Armory Chamber. Next you will head to Red Square, where you will encounter unique architecture including St. Basil's Cathedral, GUM department store, and Lenin's tomb. Lunch will be served at the legendary Cafe Pushkin, where you can sample Russian cuisine. The last tour of the day takes you through the Moscow metro stations, world famous for their architecture and art. Alternatively, our Freedom of Choice option allows you to see other site of Moscow such as the State Tretyakov Gallery or the Space Museum. This is a good option for those that have previously visited Moscow. Tonight you stay in the Ritz Carlton, a historic five-star centrally located hotel, where you can enjoy dinner and say goodbye to fellow passengers. 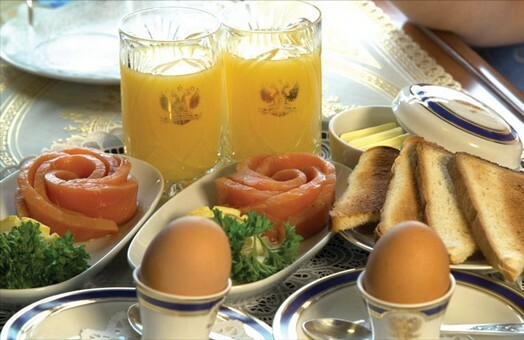 Enjoy breakfast and some free time exploring Moscow. You will be transferred to the Moscow airport for your flight home. 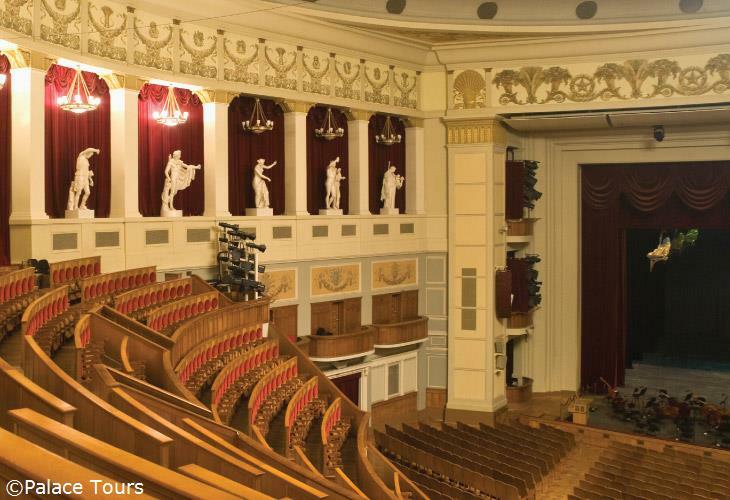 Another option is to extend your Moscow stay and attend a performance and the Bolshoi Theatre (please note tickets need to be pre-booked and are subject to schedule and availability. All meals are included, starting with dinner on the first day and ending with breakfast on the last day. Do you have tour managers onboard the Golden Eagle? We have experienced Tour Managers on-board and they are renowned for their travel knowledge and their organizational abilities which allow you to relax and enjoy your rail cruise. Also we receive exceptional passenger comments about our Tour Managers and they ensure you enjoy every minute of your holiday. Usually there is one Tour Manager onboard a train, and also a number of assistants depending on the total number of passengers. Do you provide arrival and departure airport transfers? At the start of the tour, arrival transfers from the international airport to our tour hotel are covered. As the tour ends departure transfers from our tour hotel to the airport are included. 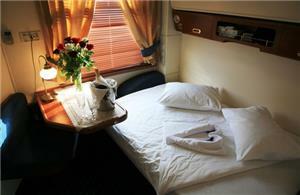 What is included in terms of hotel and train accommodation? During the tour on the Golden Eagle you will spend much of your time sightseeing or relaxing in the train’s public areas. However, you will find your hotel room or cabin on-board the train a welcome retreat at the end of a rewarding day. All hotels that you stay in will be of five-star standard, or the best available. Room upgrades are available on request, subject to availability and at additional cost. Is the price of meals included in the tour? The price of all the meals is included in the tour cost. This starts with dinner on the first day and ends with breakfast on the last day, unless otherwise stated. 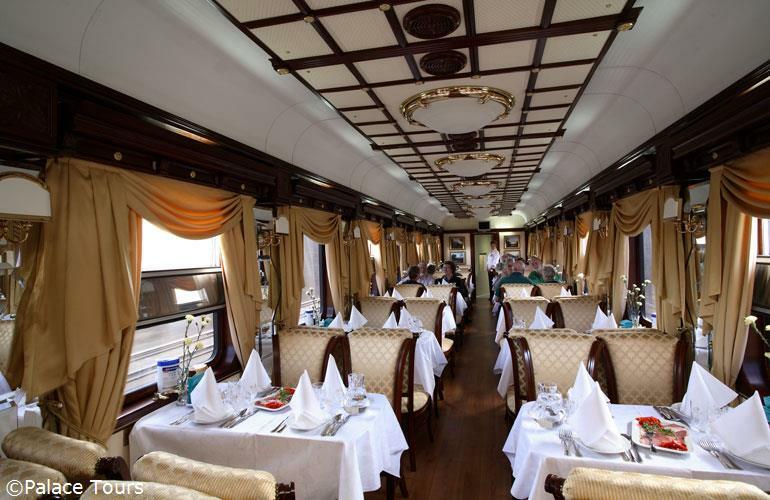 The Golden Eagle features one or two Restaurant Cars where you can dine on excellent food. What is the quality of service onboard the train? On-board the Golden Eagle you can expect service which is attentive, friendly and yet un-intrusive. 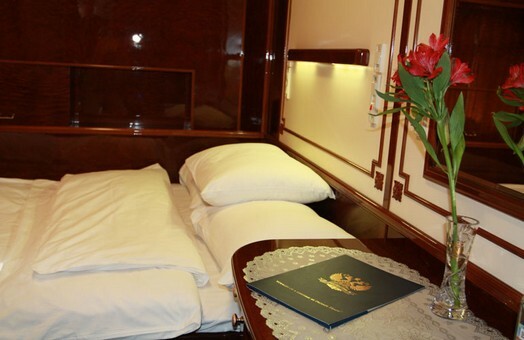 Attendants in your train car will provide housekeeping and bedding turndown services and they will also assist you to ensure that you are comfortable in your cabin. Complimentary tea, coffee and bottled drinking water will be served to you in your cabin. What is included in guided off train excursions? During the off train excursions, guides will bring alive the history and culture of each place you visit on our rail cruise. All our tours come with a packed sightseeing schedule to make the most of the time you have off the train. These will bring you closer to the culture, people and history of your destinations. Also you will find special little touches included and these will help create magical memories. Are there any doctors or medical facilities onboard the train? All our tours have a doctor onboard and he will travel with the group during the entire journey. This means that medical assistance is always available. Importantly the doctor is on call 24 hours a day and can deliver primary care to you onboard the train. Usually the doctors will speak in English and be registered with the General Medical Council in the UK. In the case of exceptional circumstances and the doctor does not speak English, translation will be provided. Are there any Porterage facilities? Once you are on-board the train, you will only have to unpack once. Then your luggage and belongings will stay with you on the train throughout the 14 day journey. However if necessary, Porterage will be provided between the hotels and stations. Do I have to pay any tips/gratuities during the tour? During the tour, you will not have to worry about tipping anyone on or off the train. 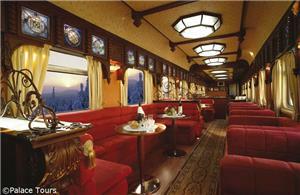 On your rail journey with Golden Eagle Luxury Trains all gratuities are included in the tour price. We encourage passengers to refrain from offering gratuities to crew/hoteliers/drivers etc as we will tip on your behalf. In case of any exceptional service received please inform us and Golden Eagle Luxury Trains will reward people accordingly. How many restaurant cars are included on the Golden Eagle? On-board the Golden Eagle one or two restaurant cars will be available to guests. However, this depends on the number of guests that are booked for a particular tour. In each car you can enjoy meals prepared by our Executive Chef who is assisted by his onboard restaurant team. Meals are prepared using the very best ingredients and these are locally sourced wherever possible. What is provided for breakfast onboard the train? The breakfast on the train includes a wide selection of fruit, cereals, orange juice and cold plates and these are presented to you as a buffet. Alternatively you can enjoy a cooked breakfast delivered by waiters to you table along with tea and coffee. What is provided as lunch and dinner onboard the train? During lunch and dinner you will enjoy fine food created by the Executive Chef that is served along with great wines. Attentive service will ensure you experience a welcoming atmosphere within the restaurant car. We also ensure that your culinary experience reflects the very essence of the countries we travel through, as well as international cuisine. What type of seating arrangement is followed in the restaurant car? On-board the train the restaurant cars can accommodate all guests in a single sitting. Also you can make use of our open-seating policy to dine wherever, and with whomever you please. Is there any dress code onboard the train or during tours? Throughout the journey there is a casual dress code. In the evening we suggest smart casual. What is included in the Bar Lounge Car? 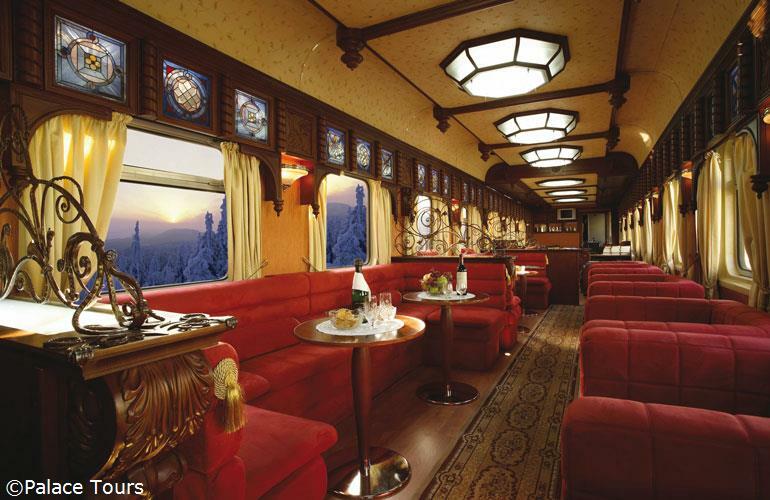 The Bar Lounge Car is the social heart of the Golden Eagle Luxury Train. Here you can rest and relax in comfortable surroundings as you read or enjoy a game of cards with friends or fellow passengers. What planning is included in daily tours? In the Bar Lounge Car the Tour Manager will outline the activities included for the day. Passengers will be given printed daily itineraries throughout the tour detailing train arrival and departure timings. Up to date weather forecasts for the next destination and information on the following day’s excursions and activities will also be provided here. What types of activities are provided to guests onboard the train? In the Bar Lounge Car and Restaurant Cars you can partake in language lessons and engaging talks hosted by experts and you can learn more about the local history and culture of countries you are traveling through. In the evenings the resident pianist will entertain you in the Bar Lounge Car and you can make use of the bar which stays open until the last person leaves. What is included in the Freedom of Choice touring options? In specific cities you can customize your journey and enjoy the opportunity to select from an array of Freedom of Choice tours. In these cities off-train excursions will take in all the major attractions but in addition you can choose from a variety of activities and enjoy a tailor-made experience. All these optional activities are included in the tour cost and there are no extra charges which ensure that you get the ultimate in terms of flexibility. However, Freedom of Choice options may vary depending on train timings, minimum number of people and local weather conditions. Occasionally we may offer an optional excursion that requires extra payment. In case you do not wish to take an off-train excursion you can either stay onboard the train (Golden Eagle only) or make arrangements privately to go on your own tour. However, you will have to ensure that you are back by the departure time. In case you are not back in time, the train will not be able to wait and must leave as per the schedule. When traveling on our tours you must be fully insured for any medical expenses that may be incurred. To buy travel insurance contact Palace Tours and we also recommend buying cancellation insurance in case you are unable to travel for any reason. Please contact us for more details. What currency do I need to bring during a tour? On-board the train US Dollars and Euros are used but guests will not need much currency. However, charges for laundry and bar bills have to be met so bring $500 in cash per person. You can also run a 'tab' on-board and make a CASH payment at the end of the tour. We do not accept Credit cards on-board any of the trains. We also recommend passengers travel with small denominations and clean bills. Importantly, marked or torn US Dollar bills are not accepted in Russia. You will also need money to pay for souvenirs and any shopping done off the train. This can be paid for in local currency and in some instances in US Dollars. If you need to change money contact the Tour Manager and/or guides and they will provide you with more information. Is there a safe onboard the train? Each cabin has a safe in which you can store any cash or valuables. Can passengers pay with credit cards and traveler’s checks in cities? ATM machines are now available in all large towns and cities and all the hotels that we use accept major credit cards. Traveler’s checks however, are virtually impossible to exchange. Will a representative meet me at the airport / train station? When you arrive one of our representatives will be waiting with a Golden Eagle Luxury Trains sign. In case you are arriving by air, you will be met after immigration, and once you have collected your luggage and cleared customs. Our representative will then assist you to your transfer vehicle to the hotel. Do any restrictions about luggage apply on the train? Within the train there is very limited space inside the cabin for storing luggage therefore, we advise passengers to bring soft-topped luggage as it is easier to store. There is also no space to store luggage under beds. However, there is luggage storage area at the end of each carriage and we recommend that passengers unpack and store their empty luggage here. Our cabin attendants will assist with this process. What footwear should I bring for this tour? All our tours require some walking so we recommend that passengers bring comfortable walking shoes with rubber soles to avoid slipping. Are toiletries provided onboard the train? 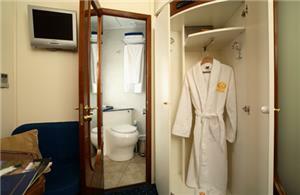 A range of L'Occitane toiletries are provided in each cabin and these include shower cream, shampoo and conditioner. Within the cabin you will also find a hairdryer, bathrobes, slippers and towels. We advise guests to bring enough medication to last the duration of the tour. Also ensure that you have spoken to your primary care physician and received a medical clearance prior to traveling. Finally, our doctor onboard the train must be advised of prescription medication that you are traveling with. Are vaccinations needed for the trip? We advise guests to contact their GP or local travel clinic to get up to date information on what vaccinations are required. In case you are traveling from America you can check the CDC website if you need further information.We advise guests to contact their GP or local travel clinic to get up to date information on what vaccinations are required. In case you are traveling from America you can check the CDC website if you need further information. What languages are tours conducted in? The main language used for tours is English. However, guides speaking other languages are available on selected tours and these are often subject to minimum numbers of passengers requesting for a particular language, or on request at additional cost. Please contact us for more information. Can specific dietary needs of passengers be accommodated on tours? Most of the special dietary requirements that passengers have can be catered for. Please contact our office for further details. Will I get access to beauty treatments onboard the train? Beauty treatments are not available on board but are available in tour hotels. Will I get access to internet onboard the train? The train does not have Wi-Fi, however there are a number of internet USB adaptors, which you can use in the Golden Eagle Bar Lounge Car. 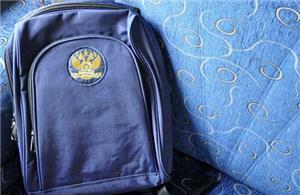 These can only be used on personal laptops carried by passengers and are provided on a first come, first served basis. However, internet coverage is limited and is usually available when the train passes through larger cities and towns. When using your mobile phone on-board the train you will notice that coverage is limited. It may also be limited in rural areas. Please check with your service provider for more information on coverage. What time should I arrive at the hotel on the first day of the tour? We recommend that guests arrive between 11.00 and 16.00 hours, as this will give them time to join the Welcome Dinner. In most hotels check-in is at 12 noon. Early check-ins are dependent on hotel availability (charges may apply). Are there any gym facilities onboard the train? Gym facilities are only available in the tour hotels. There are no such facilities onboard the train; however, tours involve a moderate degree of walking. What happens in case I require hospitalization? We will ensure that you are escorted to a hospital and make every effort to ensure that you receive the highest possible level of care. If needed we will also get in touch with your relatives at home. We recommend that you purchase travel insurance as it will cover expenses associated with hospitalization and loss of luggage. On average how many passengers do cabin attendants serve? During a tour 2 cabin attendants look after 10 passengers. Are porters available to help with baggage? Porters are available at each of the hotels and at the station to help get luggage on and off the train. Will I be informed about cities and places that we visit daily? Upon boarding the train you will be given a brochure that is specific to the route and it will have details about the journey and the places covered. Additionally, passengers will receive daily updates throughout the tour with detailed timings, weather forecasts and excursion information. What should I do if I require a foreign language interpreter? If you require a foreign language interpreter please contact our Reservations Department, and they will do their best to accommodate all requests (charges may apply). Who should I inform in case I go on a private off train excursion? During the off-train excursion period, the train may be moved to another platform or depot so you should inform the Tour Manager if you intend to make you own tour plans during the day. Can passengers in wheelchairs go on off train excursions? Passengers in wheelchairs can go on off-train excursions but if they require a wheelchair this must be specified at the time of booking the tour. We will do our best to accommodate the request (charges will apply if assistance is required for maneuvering the wheelchair). However, please note it may not be possible to go on all of the excursions. How many people can travel on off tour excursions? Can Golden Eagle accommodate dietary restrictions? Yes, Golden Eagle can make adjustments to your dietary restrictions, excluding Kosher needs due to the remote locations the train passes through. Just notify Palace Tours prior to booking your trip. Where is my luggage stored, and how might I access it during a long journey? Empty suitcases are stored at the end of each carriage. Ask your steward if you need to access your suitcase during the journey. Generally, the Golden Eagle follows an, “unpack once,” mentality whereby passengers unpack their items into their cabin at the beginning of the trip, and use a smaller carry on bag at excursions and hotel stops. Are there safety measures or precautions in place? There are certain safety measures already in place for passengers. Smaller numbers in group tours allow for more accountability and personal attention, and therefore a heightened sense of safety during excursions. While there has currently been no trouble in areas of Golden Eagle’s tours, if necessary, changes will be made to the itinerary. The safety of the passengers is Golden Eagle’s top priority. Are there accommodations for families on board? 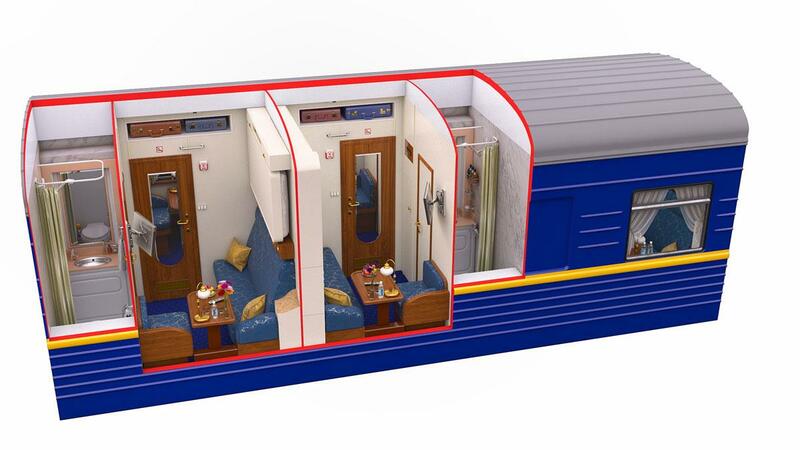 There are no interconnecting rooms on the Golden Eagle, but families spread across multiple cabins will be placed next to each other in the carriages. The Golden Eagle train is an adult-oriented train and there are no cots or changing facilities. It is up to parents if they choose to bring their children, but there is a wide range of ages aboard the train. Also, Golden Eagle adds and removes carriages depending on the size of the group on the train.